An investigation of soul through the body. A single thread is cast through space, invoking emptiness - a basket is placed full of blank pages, waiting for whispers and entrances. The unraveling - the revealing tale of the hips, the feet, the head, the hands, and the breath- an unveiling of truths discovered through the 5Rhythms, one body part at a time. We will write, wonder and weather our way through light and shadow, footfalls and silences, creating the Ritual Theater of your/our stories detailed soulfulness. Sculpting spirit into shape, writing soul into story, dancing mind into the wind and tracing the heart home. Furious dancing, mysterious humor and indelible visuals may occur. Live Wire is a 'plug in' to creative action, an opportunity to reawakening and sharpen those places in ourselves that need realigning or perhaps rewiring back to what’s most original and true. Lorca Simons is dedicated to the creation of physical theatre that is both interactive and transformative. Lorca was born and raised in Texas where she grew up in her father’s experimental theatre company Hip Pocket. A graduate of The University of North Carolina School of the Arts theatre conservatory before moving to New York City. Educated in both experimental and traditional theatre. She has blazed through productions from Off Broadway to fringe, as well as television and film. Lorca followed her instincts to the unique directing vibration known as Gabrielle Roth and a 19 year creative collaboration bloomed. Lorca studied and trained with Gabrielle from the mid-90’s and was a Co-Founder and a Co-Director of 5RT, the experimental theatre wing of the 5Rhythms world. A place she has stepped into with her expansive Texan feet first collaborating on numerous original productions, workshops, and ritual theatre explorations. Lorca is a Certified 5Rhythms® Teacher actively creating theatre internationally through a series of LIVE WIRE Ritual Theatre Labs: Breath in Motion, Roots, Electric Landscapes, and Soul Threading. She is currently developing an original piece of theatre titled “Love Letters to a Raven” as well as sourcing mainstream projects. Alessandro Moruzzi is a Certified 5Rhythms® Teacher, Accredited by 5RTA (5Rhythms Teachers Association) to teach both Waves and Heartbeat. He is the Co-Founder of The City Waves™ in San Francisco. Alessandro is also a musician, Certified Holistic Health Coach and Esalen Massage Therapist from World School of Massage and Holistic Healing Arts SF. He was born, raised and spent the first half of his life in Italy, calling San Francisco home since 1983. He crossed path with 5Rhythms after many years of living and traveling in many different parts of the world, exploring, searching and seeking; inside and out. Now embracing this practice fully that is finally revealing and supporting his purpose in life, balancing mind, body and spirit; and sharing this powerful medicine for everyone he crosses path with. Enriched by his music, theater, performance and shamanism background, Alessandro intuitively crafts heartfelt, playful, grounded and healing journey through the Waves and Heartbeat maps, offering a safe and transformational space for all. He currently resides in San Francisco, teaches in SF Bay Area and around the world. PREREQUISITES: No Prerequisites. The hours of this workshop qualify for the Waves and Elective requirements for the 5Rhythms Teacher Training. Friday Night is an Open Class. You're welcome to drop in, and bring friends who might be interested, if you or they decide to join us for the full weekend, just add the difference to register. Everyone is welcomed. 10% off for Student with valid ID, Senior (65+). 20% off for 5RTA Teacher. Limited Work Study option is available. Please contact us to register for this special rate. 30 days in advance: $25 cancellation fee. 14 days in advance: $50 cancellation fee. No refunds can be issued less than 14 days from the start of a workshop. The City Waves reserves the right to cancel any workshop in the event of insufficient registration or other unforeseen circumstances, in which case, the full amount paid to register for a workshop will be refunded to the registrants. In the event of cancellation, an attempt will be made to notify registrants no later than 10 calendar days before the start of the workshop. All other expenses incurred including but not limited to flights and accommodation arranged for the purpose of attending a workshop will not be covered. Warriors need strength, clarity and trust in themselves to be able to stand their ground. And above all, to reach a real peace, to be motivated by love. The emotions of the heart of warriors are their strength and their vulnerability and they need to be understood and embraced with every cell of their bodies. Fear is not an obstacle, in fact it can be an ally of courage. Anger can be mastered into an enormous source of power and generate a liberating forgiveness. Sadness can be the release of embedded shrapnel and a final surrender to ourselves. Joy can be the ecstatic celebration of the liberation from a heavy useless armor. To discover in compassion the ultimate invisible unifying element to find Spirit. Alessandro is a certified and accredited 5Rhythms® teacher and all workshop hours count toward 5Rhythms® Teacher Training Heartbeat prerequisites. "Incredibly grateful to Alessandro for being the Guide & Space holder....many hearts were cracked open this weekend and are loving way beyond where we've loved before!" - Karen M.
Registered and paid by February 28th get discount at S$300 for entire workshop, after @S$340. 15% off for 5RTA Teacher. Contact: Jada Jane Boh. Please email jadajane04@gmail.com for more details. "The biggest embrace of love you'll ever make is to embrace yourself completely. Then you'll realize you've just embraced the whole universe, and everything and everybody in it." Let's embrace ourselves, completely. Surrendering. Let's experience the ecstatic embrace of self love, deeper and deeper exploring and re-discovering every part of ourselves: our bodies, our minds and our souls. This time focusing on our hearts. Stepping into the lights and shadows of our emotions, guided and supported by the power of the 5Rhythms Heartbeat map. In this journey we'll find out that Fear can be our protection, Anger our defense and Sadness our release. And we can uplift ourselves into Joy, to reach Compassion and the connection with everything. 10% off for Student with valid ID, Senior (65+). 30% off for 5RTA Teacher. Limited Work Study option is available. Please contact us to register for this special rate. Heartbeat is the 5Rhythms map of the emotions. Emotions sometime can be overwhelming and very evident, or totally hidden and difficult to express. Our hearts beat at their rhythm and our body always respond clearly, without the need to rationalize what's happening to us. Our body intelligence is always functioning, and acting independently even when we might feel numb or obfuscated by rage or confusion. We will experience through our dance what's inside of ourselves, and how it manifests in our movements. Embodying our emotions to find out more about our heart and to fall in love with every aspect of it. To fall in love with ourselves and to find renewed balance and strength to step, openhearted, in the direction of our true purpose in life. Come dance and explore the many shapes of our hearts! *This workshop counts as Waves and Heartbeat hours toward the 5Rhythms Teacher Training. Alessandro Moruzzi is a Certified 5Rhythms® Teacher, Accredited by 5RTA (5Rhythms Teachers Association) to teach both Waves and Heartbeat. He is the Co-Founder of The City Waves™ in San Francisco. Alessandro is also a musician, Certified Holistic Health Coach and Esalen Massage Therapist from World School of Massage and Holistic Healing Arts SF. He was born, raised and spent the first half of his life in Italy, calling San Francisco home since 1983. He crossed path with 5Rhythms after many years of living and traveling in many different parts of the world, exploring, searching and seeking; inside and out. Now embracing this practice fully that is finally revealing and supporting his purpose in life, balancing mind, body and spirit; and sharing this powerful medicine for everyone he crosses path with. Our ancestors had natural elements at the base of their science and philosophy. With slight differences depending on cultural and geographical origin of course. We still believe in the power and influence of the depth of their findings, as a spiritual path and direction to be in touch with nature, holistically, with our heart, our senses and our rationality. We'll dance for, to and with them, starting our journey with the element Earth in Flowing. Going deep in our inner power, we’ll embrace Fire, expressing its flaming energy in Staccato. Going through the path of least resistance with Water element is the force of release and renewal that we'll dive into in Chaos. To enjoy the lightness of flying beings in Air, celebrating our new found selves with Lyrical. To arrive and dissolve in Ether, in the invisible, in the emptiness in the Oneness of Stillness. Join us in this travel through space, time and reality, dancing with the Rhythms and the Elements. To search, to remember, to find, to transform. This workshop is happening during a full moon weekend. It will be deeply transformational. Alessandro Moruzzi and Vehllia Tranne are both Certified 5Rhythms Teachers, Accredited by 5RTA to teach Waves, while Alessandro also teaches Heartbeat. They have many years of experience in 5Rhythms, dance, music, theater, performance, healing, spiritual practices and shamanism. They always draw their inspiration from nature, deeply connected to the ancestors, offering heartfelt intuitively crafted experience and support for each dancer, holding a safe and transformational space for all. No prerequisites required. The hours of this workshop qualify for the Waves requirement for the 5Rhythms Teacher Training. Friday Night is an open class. Walk-ins welcome. $35 prepay. $40 at the door. Student with valid ID / Senior (65+) and 5RTA Teacher $30 at the door. 10% off for Student with valid ID, Senior (65+). 30% off for 5RTA Teacher. Limited Work Study and Scholarship options are available. Please contact us to register for this special rate. The 5Rhythms practice is a powerful moving meditation practice that explores, supports, and introduces gateways to find new space to free our potentials for personal growth and development. In this workshop we will move with the simplicity and power of the body through the gateways related to each rhythm, to experience and absorb the intensity and depth of our own dance as we connect with our moving center within. It's through our dance, our prayer and our presence that we unify and enjoy the difference of tribes gathering from all directions. East and West melting with North and South, mixing flavors and colors, sounds and motions, to create a unified powerful ecstatic wave. In the Path to the Center. In the Path of discovering, activating and energizing our own Moving Center. Through our dance we explore the depth of our essence, we empower our determination, we surrender to our own creation, we enjoy our lighter self, to finally embrace the mystery of our existence in its full potential. To renew, to stand, to enjoy, to get closer and to discover new tools for the realization of our true purpose in life. Join us in this journey on the Path to the Center, together! 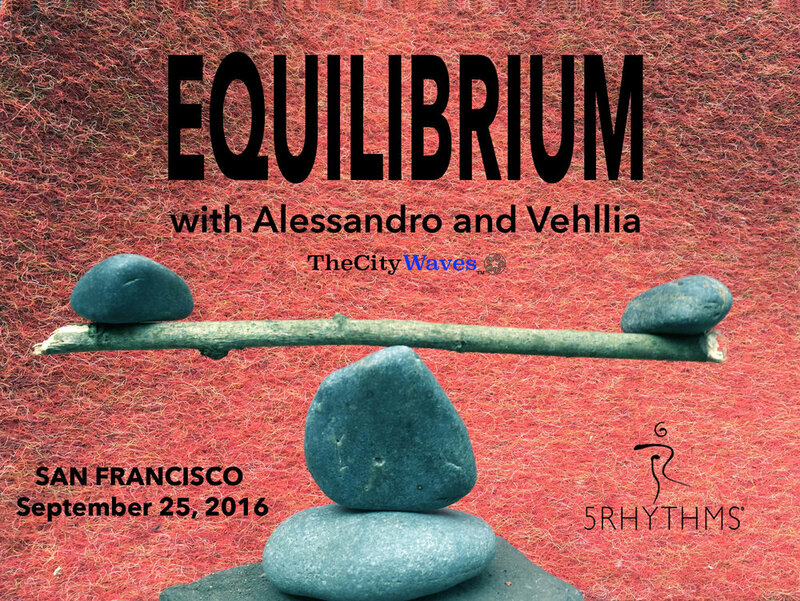 Alessandro Moruzzi and Vehllia Tranne are Certified 5Rhythms® Teachers Accredited by the 5RTA (5Rhythms Teachers Association), and Founders of The City Waves™, which offers weekly 5Rhythms classes in San Francisco. All of their classes and workshop hours count as Waves on the 5Rhythms Dancing Path towards Teacher Training. Together, Alessandro and Vehllia offer many years experience in 5Rhythms dancing, music, meditation, theater and performance background, healing and spiritual practices, and shamanism; offering heartfelt and intuitively crafted experience and support for each dancer, holding a safe and transformational space for all. No prerequisites required. This workshop fulfills 15 Waves hours of 5Rhythms Teacher Training prerequisites. Los 5Ritmos es una práctica poderosa de meditación a través del movimiento, que explora, sostiene e introduce puertas de entrada para abrir espacios que liberen nuestro potencial de desarrollo personal. En este taller nos moveremos con la simplicidad y el poder del cuerpo, a través de las puertas de entrada de cada ritmo, para experimentar y absorber la intensidad y profundidad de nuestra propia danza mientras nos conectamos con nuestro centro. Es a través de nuestra danza, nuestra oración y nuestra presencia que logramos unirnos y disfrutar de la diversidad de tribus que se reúnen desde diferentes direcciones. Este y oeste, unidas con norte y sur, generando una mezcla de sabores y colores, sonidos y movimientos, para crear una poderosa ola de éxtasis. El Camino al Centro. En el camino de descubrir, activar y energizar nuestro propio centro de movimiento. A través de nuestra danza exploramos la profundidad de nuestra esencia, potenciamos nuestra determinación, sucumbimos a nuestra creación, disfrutamos nuestra liviandad, para finalmente abrazar el misterio de nuestra existencia en su máximo potencial. Nos renovamos, nos mantenemos en pie, disfrutamos. De esta forma nos acercamos a descubrir nuevas herramientas para la realización de nuestro propósito en la vida. Acompáñanos en este viaje juntos al Camino al Centro! Foot by foot, step by step, penetrating deep into our being, to discover the new, to re-discover what we have forgotten, to explore hidden and surprising corners of our existence, simply abandoning ourselves, without prejudice and restrictions, to music , to movement, to dance, leaving the body to freely respond to the different rhythms in a moment of personal inquiry, sustained and expelled by the energy of the group and by the strength of a practice devoted to the re-discovering of ourselves and offering tools of spiritual, personal and social transformation. Diving in the waves of our inner sea, with confidence, with emotion, with curiosity. Going to the depth of our soul. Then go back to the air, to the sun. Renewed, refreshed, regenerated by this new adventure. 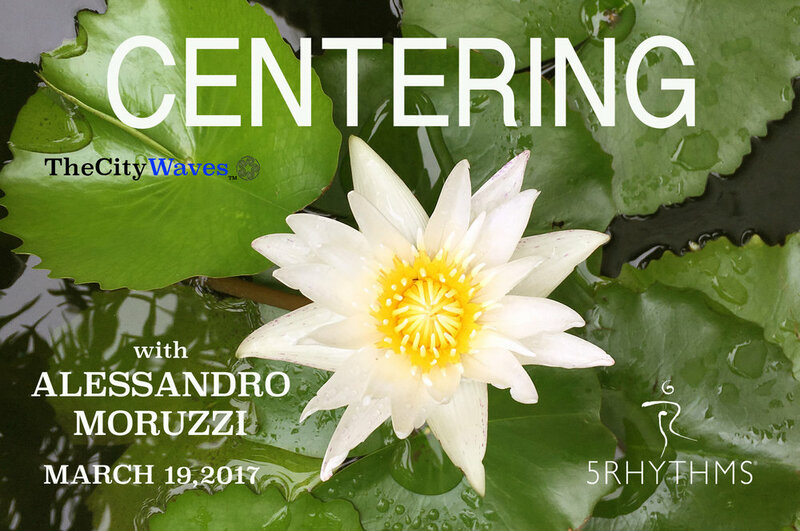 Alessandro Moruzzi is a Certified 5Rhythms® Teacher Accredited by the 5RTA (5Rhythms Teachers Association), and Founder of The City Waves™. He is also a certified Holistic Health Coach from World School of Massage and Holistic Healing Arts SF. Alessandro was born, raised and spent the first half of his life in Italy, calling San Francisco home since 1983. He crossed path with 5Rhythms after many years of living and traveling in many different parts of the world, exploring, searching and seeking; inside and out. Now embracing this practice fully that is finally revealing and supporting his purpose in life, balancing mind, body and spirit; and sharing this powerful medicine for everyone he crosses path with. Piede dopo piede, passo dopo passo, ci immergeremo nel profondo del nostro essere. Per scoprire il nuovo, per ri-scoprire quello che abbiamo dimenticato, per esplorare angoli nascosti e sorprendenti della nostra esistenza. Semplicemente abbandonandosi, senza pregiudizi e restrizioni, alla musica, al movimento, alla danza. Lasceremo che il corpo risponda liberamente ai diversi ritmi in un momento di ricerca personale, sostenuti e ispirati dall'energia del gruppo e dalla forza di una pratica devota al ri-trovamento di noi stessi e all'offerta di strumenti di trasformazione spirituale, personale e quindi sociale. Tuffarsi nelle onde del nostro mare interiore, con fiducia, con emozione, con curiosità. Andare verso il profondo. Per poi risalire all'aria, al sole. Rinnovati, rinfrescati, rigenerati da questa nuova avventura. Alessandro Moruzzi è un insegnante certificato 5Rhythms® accreditato dalla 5RTA (5Rhythms Teachers Association) oltre che fondatore di The City Waves™. È inoltre istruttore olistico di salute certificato della World School of Massage e Holistic Healing Arts SF. Alessandro è nato, cresciuto e ha trascorso la prima metà della sua vita in Italia, si è poi trasferito a San Francisco nel 1983. Ha incrociato la Danza dei 5Ritmi dopo molti anni di viaggi, esplorazioni e ricerche; dentro e fuori. L’abbraccio completo a questa pratica e la condivisione di questa potente medicina con tutti quelli che incrocia finalmente gli ha rivelato e sta sostenendo il suo scopo di vita, equilibrando la mente, corpo e spirito. Arricchito dal suo background musicale, teatrale, performativo e sciamanico, Alessandro crea intuitivamente accorati e ancorati viaggi di guarigione attraverso le onde, offrendo uno spazio sicuro e trasformativo per tutti. Attualmente risiede a San Francisco, insegna settimanalmente in città, nella Bay Area e all'estero. Inoltre è in procinto di conseguire il livello di insegnamento Heartbeat. La classe del venerdì è parte integrante del workshop, ma non è obbligatoria. Si può partecipare anche solo alla classe aperta del venerdì. • Sabato €70 earlybird | €80 dopo..
• Venerdì €20 earlybird | €25 dopo.. In this workshop we begin by simply receiving the medicine of continuous motion, starting with our feet, and revolving into the fullness of our being. Receiving the medicine of Flowing we let in the gift of being a centripetal force, a body moving in a circular path, directed toward the center around which that body is moving. And in that endless circle we uncover, discover, and recover our genderless, soul-full- more feminine nature – receiving being a receiving being. Join us as we step into the beginning, practicing Flowing from start to starting over, from beginning to beginning anew, from ground up to sacred ground. Tammy Burstein started practicing the 5Rhythms® in the 20th century, emerged as a 5Rhythms® teaching at the dawn of the 21st, and has been living them since before she knew they existed. She is an urban life form who makes New York City her home base and soul inspiration. An itinerant wonderer she is a Moving Center NY and 5Rhythms Teacher Training teaching staff member, teaching the Waves (2001), Heartbeat (2010) and Cycles (2015) maps locally and globally. She has made her living as a dancer, a lighting designer, a travel agent, and a librarian. She creates her life dancing the 5Rhythms®. “Tammy is an exceptional woman, teacher and DJ both on and off the floor. I encourage you all to experience the grounded, soft, wild dancing space that she has created.”– Jonathan Horan, Director of The Moving Center School New York. No Prerequisites. This workshop fulfills 15 Waves hours of 5Rhythms Teacher Training prerequisites. Friday Night is an open class. You're welcomed to show up at the door, and bring friends who might be interested, if you or they decide to join us for the full weekend, just add the difference to register. Everyone is welcomed. $35 prepay. $45 at the door. Student with valid ID / Senior (65+) and 5RTA Teacher $30 at the door. 15% off Full Price for Student with valid ID, Senior (65+), and 5RTA Teacher. Limited Work Study and Scholarship options are available. Please contact us to register for this special rate. It's like a walk in the beach, slowly feeling the sand on your feet, feeling the moisture then immerse the toes in it. Being in contact with the water and enjoying the interaction with a new element. Step further in order to activate the sensation of contact with the waves. Our breath becomes deeper and it helps us open our heart. This way we prepare ourselves to begin a journey inside our soul, to discover ourselves, and the immense ocean of our spirit. Will you join us? No experience and prerequisite required. Just your curiosity, commitment to be present and open heart. This is an unique opportunity to deepen your knowledge of the 5Rhythms and to experience how this practice can be powerful, enriching and transformational. Vehllia Tranne is a Certified 5Rhythms Teacher Accredited by the 5RTA (5Rhythms Teachers Association), Founder of The City Waves, which offers weekly 5Rhythms classes, Sweat Your Prayers and produces numerous 5Rhythms workshops in San Francisco. She is also a Yoga Teacher Certified by Yoga Tree San Francisco. All workshop hours count as Waves towards Teacher Training for 5Rhythms Dancing Path. Es como ir a la playa, acariciando la arena con los pies. Poniéndote en contacto con el agua, y disfrutando la interacción con un nuevo elemento…un paso más hacia adentro para activar la sensación de contacto. Nuestra respiración se hace más profunda y nos ayuda a abrir el corazón. Así nos preparamos para iniciar el viaje al interior de nuestra alma, al descubrimiento de nosotros mismos, y al inmenso mar de nuestro espíritu. Reflection is a gift for our soul. By going deeper within ourselves, we may discover our true gifts. We gain clarity of who we really are and create who we want to be and our true offerings to the world. Dancing with New Moon energy to embody our intention for the coming new year and dancing through reflection of what the past year has been for us. We will dance through the 5Rhythms map with a gentle and deep grounding to integrate the past, and the future, so we can step into the present in Flowing, to honor all parts of ourselves. This will give us the support to step into Staccato, where we create intentions with distinctive images and movements of our newly defined determination, so we may release them altogether in swirls of surrender in Chaos. Through this release, we discover ways to evolve into a trance-like celebration of life, true essence of Lyrical. Shapes and repetitions will define ourselves and open space for us to be fully present in Stillness, so to discover in our breath the power and wisdom of the unified field. "Energy moves in waves. Waves move in patterns. We live in a world where complicated, chaotic and confusing rhythms of events are overwhelming our senses, overloading our emotions and effecting our physical status. In this workshop we will go into the journey of the 5Rhythms map, experiencing and embodying how it is possible, through the grounding of Flowing, stepping into the clarity of Staccato, getting ready to release in Chaos so to feel lighter in Lyrical and to land into welcoming emptiness in Stillness. Will you join us in this journey? 5Rhythms® is a dynamic movement meditation practice using dance to get in touch with ourselves, our bodies and our feelings, and to express this through our movements. The 5Rhythms® (Flowing Staccato Chaos Lyrical Stillness) are states of being and they teach us that life is energy in motion, freeing us from any fixed notions about people, places, objects or ideas. Created by Gabrielle Roth and practiced by tens of thousands worldwide, 5Rhythms® is a philosophy, perspective and practice rooted in the principle that if you put the psyche in motion it will heal itself. Movement is both the medicine and the metaphor, reaching across all languages, cultures and age groups to transform suffering into art, art into awareness, and awareness into action. Each rhythm offers a different energy field in which you find your own expression. Everyone is a dancer. There are no steps to follow. Vehllia Tranne is a Certified 5Rhythms® Teacher Accredited by the 5RTA (5Rhythms Teachers Association) and Founder of The City Waves™. She is also a yoga teacher certified by Yoga Tree San Francisco. Vehllia has been celestially dancing before even learning to walk. She is a passionate healer, courageous shape-shifter, and natural teacher. After spending most of her life searching for inner peace and living in many countries, weaving both Eastern and Western ways of living, she was guided to transform her life to a more spiritually based existence and a chance encounter with the 5Rhythms rocked her world, igniting and inspiring her passion for dance as a tool for self-discovery, healing and transformation. Her connection with her volcanic ancient ancestral land is evident in her grounded flowing and it's a sacred gift for all of us. Vehllia’s teaching style reflects her spontaneity and sincere love for life, expressed beautifully in her inspirational dance offering to anyone interested in a deep transformational exploration of self through moving meditation. She currently resides in San Francisco and teaches around the Bay Area. No experience and prerequisite required. Just your curiosity, commitment to be present, and open heart. This is a unique opportunity to discover a sense of freedom and inner peace as we go through all the rhythms. Please wear something comfortable to move with and bring a bottle of water. All workshop hours count as Waves towards Teacher Training for 5Rhythms Dancing Path. Due to limited spaces, we are only able to reserve the seat after fee payment. Please send in your full name, number, and email address and we will provide bank details so you can reserve your place. Heartbeat is an active, embodied investigation of our emotional map. Using the physical map of the 5Rhythms, we will explore the territory of our emotions, discovering how our fear, anger, sadness, joy, and compassion move. Befriending and somatically moving emotions set us free to be present and available for life's mysterious unfolding to happen. The 5Rhythms dance gives us a fun, creative, and physical way to practice expressing ourselves so that we may live authentically and spontaneously in the moment. Join us for an embodied heart exploration! Davida Taurek, MS, has a diverse background in counseling psychology, dance, creative arts, and body-centered therapies. She is an Associate Faculty at Prescott College, and coordinates the Somatic Psychology Emphasis in the Masters of Science Counseling Program. Davida has a private practice in counseling, teaches annually at Esalen Institute, and is a Certified Instructor of 5Rhythms®, Motion Theater®, Watsu®, and WaterDance®. She worked closely with Gabrielle Roth and has been teaching 5Rhythms for over 20 years. Davida is full-heartedly committed to this embodied path, and widely known for her delightful sense of humor, passion, and evocative devotional teaching style. 10% off for Student with valid ID and Senior (65+). 20% off for 5Rhythms Certified Teacher. Limited Work Study options are available. Please contact us to register for this special rate. From Presidio Blvd, turn left on Funston Ave, right on Moraga Ave. The studio is located at the corner of Moraga Ave and Arguello Blvd, across the street from Presidio Crissy Field main post. Convenience fee parking at entrance to the studio. Credit card and coins are accepted. Parking fee is enforced DAILY 8am-6pm in Presidio. Free parking after 6pm. This is a ONE TIME EVENT ONLY in 2017. An opportunity not to be missed, to dance with Jonathan Horan in San Francisco. In this class we dance hard, we dance bold, we dance deep. Jonathan takes us to the place where the soul of hip hop, the catharsis of rock and roll, the trance of techno and the heart of house collide into the world beat. And in this beat, we get together to reinvent ourselves, to discard last week’s fears and move into this week’s dreams. This is our practice. It doesn’t matter where we come from or how we grew up or whether we can or can’t dance. Movement is medicine, and whether we feel clumsy or graceful, it heals us. Real learning happens when we show up and move because the body can’t lie. It lets us know right away if we’re feeling closed or open, fixed or fluid, tight or loose, off or on. It’s so easy to lose our balance, to become lopsided, to be too in our heads, too emotional, too easy-going, too controlled. We carry so many things, and not just in our backpacks. What do we do with all this repressed stuff, the headtrips that are holding us back, holding us down, and turning us into something we’re not? We dance. We dance with whatever’s going on inside of us and connect with others who are doing the same. Jonathan A Horan is Gabrielle Roth's son and closest collaborator. He is the Executive Director of her international institute, 5Rhythms® Global as well as the Director of The Moving Center School NYC. Jonathan has been immersed in the 5Rhythms practice throughout his life and continues to be a key catalyst in its evolution. He is a member of the core teaching faculty of both training and advanced work and teaches workshops of all levels around the world. He has taught at Vassar College and currently teaches for a variety of institutes such as Esalen, Omega, Kripalu and Naropa Institute and an annual residency in Blue Spirit in Costa Rica. His weekly NYC High Vibrations class has been featured in New York Magazine, Breathe, and the Daily News, and was chosen as the hottest movement class in New York by the Village Voice. 10% off for students (with valid ID) and seniors (65+). 15% off for 5RTA Teachers. Limited work study positions are available. Please contact us to register for this special rate. From Presidio Blvd, turn left on Funston Ave, right on Moraga Ave. The studio is located at the corner of Moraga Ave and Arguello Blvd, across the street from Presidio Crissy Field main post. Convenience fee parking at entrance to the studio. Parking fee is enforced DAILY 8am-6pm in Presidio. Free parking after 6pm. All class hours count as prerequisites for 5Rhythms Teacher Training. Come for a day of dance, ritual and prayer in a beautiful urban park surrounded by greenery and wildlife. This is the second year for a daylong Medicine Circle being offered in Presidio SF, and the only one scheduled in 2017. The number of participants are limited to create potency and sacredness of the circle. Circles have been used by many indigenous cultures throughout time as a place for ceremony and transformation. Medicine Circle weaves ritual, community, movement, sounds and prayer allowing us to reconnect with Spirit. We dance, and the circle holds the big, small, quiet, loud, joyful, still, cathartic, and everything-in-between dances. We use sound – drums, rattles, bells, rain sticks, and song – to call Spirit back in. We pray, for ourselves, for others and for the greater whole. Dance and presence are our offerings. Being together in this sacred way is our medicine. No prerequisite required. This workshop counts as Waves for the 5Rhythms Teacher Training. Sylvie Minot is the executive director and founder of Syzygy Dance Project, a 5Rhythms Certified Teacher, and the creator of Medicine Circle. Wendy Heffner trained as a 5Rhythms Movement Therapist, and has used dance as a transformational practice for over 15 years. Together, they lead Medicine Circle groups in the San Francisco Bay Area, and around the world. The 5Rhythms® (Flowing, Staccato, Chaos, Lyrical and Stillness) forms a map which gives us the possibility to dance the rhythms in our own life. Each rhythm has a physical gateway into our own energy, into our own dance, and its light and shadow. The summer sun warms us with its bright light, that also generates dark shadows. Things we like about ourselves, we tend to show and bring to light. Things we dislike, we keep in the shadow not to be seen. When there is light, shadow is naturally generated. This is when we could make a choice to have integrity within ourselves, acknowledging both so that we could dance with both. These aspects can and should be explored as their discovery will bring us into full appreciation of who we are as a whole, mind body and soul. Exploring the lights and shadows of ourselves and moving through them on the dance floor, give us a chance for transformation. From being frozen to being fluid, from tense to being determined, from lost to being clear, from spaced out to being present, from numbed to being connected with spirit. 10% off for Student with valid ID and Senior (65+). Work Study and Scholarship options are available. Please contact us to register for this special rate. WHY MOON WAVES FOR WOMEN? This workshop is an invitation for all who identify as a woman to come together to dance the 5Rhythms® and experience this in relation to the full moon. It's an opportunity to dance in a women only space whether you are a daughter, sister, friend, grandmother or woman who simply wants to dance — this class is for you. April’s full moon — also known as the Pink Moon — falls on Tues, 11th April 2017 (moon waves will begin a few days prior). Vehllia Tranne is a Certified 5Rhythms® Teacher Accredited by the 5RTA (5Rhythms Teachers Association), and Founder of The City Waves™. Vehllia has been celestially dancing before even learning to walk. She is a passionate healer, courageous shape-shifter, and natural teacher. Vehllia’s teaching style reflects her spontaneity and sincere love for life, expressed beautifully in her inspirational dance offering to anyone interested in a deep transformational exploration of self through moving meditation. Parking for disabled patrons is provided at the entrance. Wheelchairs have ground floor access and wheelchair friendly restrooms. A lift provides access to the second floor where the Academy and Indicine are located. If you have specific accommodations needed to participate fully in this event, please let us know. Energy moves in waves. Waves move in patterns. Patterns move in rhythms. A human being is just that - energy, waves, patterns, rhythms. Nothing more. Nothing less. A dance. All these energies [the five rhythms] come together in you. In your deepest center, You are the still-point. You are the rhythm beyond stillness, the feeling beyond compassion, the sexual energy beyond celibacy, the life force beyond death, the vibration beyond inspiration. The 5Rhythms practice is a powerful moving meditation practice that explores, supports, and introduces gateways to find new space to free our potentials for personal growth and development. In this workshop we will move with the simplicity and power of the body through the gateways related to each rhythm, to experience and absorb the intensity and depth of our own dance as we connect with our moving center within. Alessandro Moruzzi is a Certified 5Rhythms® Teacher Accredited by the 5RTA (5Rhythms Teachers Association), and Founder of The City Waves™. He crossed path with 5Rhythms after many years of traveling, exploring, searching and seeking; inside and out. Now embracing this practice fully that is finally revealing and supporting his purpose in life, balancing mind, body and spirit; and sharing this powerful medicine for everyone he crosses path with. Enriched by his music, theater, performance and shamanism background, Alessandro intuitively crafted heartfelt, grounded and healing journey through the Waves offering a safe and transformational space for all. 10% off for Student with valid ID and Senior (65+). Please contact us to register for this special rate. Scholarship and work study option are available. Please contact us to apply. Public Transportation: San Francisco Municipal Railway (MUNI) buses serve the Presidio via the 28 (to Golden Gate Plaza), 29 (from Sunset to Baker Beach), and 43 (to Letterman area) lines and other lines terminate near the Presidio's Lombard Gate. Dance your truth to fully experience freeing the body, expressing the heart, emptying the mind, awakening the soul, and embodying the spirit. Set your intention. Be bold. In this workshop we will dance our way through the power of intention as individual, with community, and the world, supporting each other to be true to ourselves, sharing the energy that we all have, to build moments of sincere connections between the inside and the outside, with respect, trust and love for each other. 5Rhythms is a map, a process, a sequence of sounds and movements that starts with Flowing, the discovery and deepening of ourselves, the embodiment of what is truly inside our system. The determination and outward expression of Staccato changes the focus of our dance to the center of our hips and the building up of fire and passion. Chaos breaks all patterns. The intention revealed in the first rhythm mixed with the strength built on the second rhythm will be wildly mixed in an un-controlled release of what is getting in the way of our journey. Lyrical is a celebration of a re-newed clarity and the expressive realization of our lightness of being. To arrive at Stillness where the breath and silence are the perfect completion to destination for our unique intentions. Release all that is accumulating in our system that creates clutter and useless weight. In our mind, in our body and in our soul. So many ways to do it. We dance it. We find our soft feminine side in Flowing, explore our strength and determination in Staccato, as we let go, surrender and release all that needs to be released in Chaos; to get lighter and celebrate our renewal in Lyrical, when we finally rest and find peaceful breathing in Stillness. During our time together, in a safe and sacredly held space we will build up our confidence and strength to step into a journey that will surprise and excite all of us to dance and be danced. The Club is about 20km from Singapore Changi Airport. Taxi and Uber are affordable and reliable transportation option. Public transport: MRT. Take the NE line and stop at Farrer Park MRT Station. Use Exit B. Tessensohn Clubhouse is just 5 minutes walk down the road. Your body is the ground metaphor of your life, the expression of your existence. So many of us are not in our bodies, really at home and vibrantly present there. The 5Rhythms – Flowing Staccato Chaos Lyrical Stillness® – are states of Being. They are a map to everywhere we want to go, on all planes of consciousness – inner and outer, forward and back, physical, emotional and intellectual. They are markers on the way back to a real self, a vulnerable, wild passionate, instinctive self. Created by Gabrielle Roth and practiced by tens of thousands worldwide, 5Rhythms® is a philosophy, perspective and a dynamic movement practice rooted in the principle that if you put the psyche in motion it will heal itself. Movement is both the medicine and the metaphor, reaching across all languages, cultures and age groups to transform suffering into art, art into awareness, and awareness into action. Wherever the 5Rhythms are practiced, a community is born to dance, to sweat, to change, to support, and to provide a safe space for each of us to shatter the ego’s hold and awaken the juicy, unpredictable, fascinating, edge-walking, rock star part of ourselves that yearns to be free. Everyone is a dancer, there are no steps to follow. Each rhythm offers a different energy field in which you find your own expression. No experience and prerequisite required. Just your curiosity, commitment to be present and open heart. This is an unique opportunity to discover how dancing the 5Rhythms can give you a sense of freedom and inner peace as we go through all the rhythms. This is a one time event. Please register early. Space is limited. In proximity of the moment when day and night are of equal length we will explore our own equilibrium in our dance. The 5Rhythms practice has many ways to support and open gateways to find new space for personal growth and development. Through this moving meditation practice we will explore how much our body and soul are in a dynamic search for equilibrium. Yin and Yang, masculine and feminine, light and darkness are dancing constantly together. They give shape to the full existence of everything. For an instant, the equinox has a perfect balance of the two. Let's dance this ephemeral moment together. Alessandro and Vehllia playfully bring the unique side of themselves together, facing each other, standing side by side, from far away, close in and out, back to back, giving and receiving. Different and yet complimentary and united. Stimulating and inspiring each other and everyone else. In search of equilibrium. Together, they offer many years experience in 5Rhythms dancing, music, meditation, theater and performance background, healing and spiritual practices, and shamanism; offering heartfelt and intuitively crafted experience and support for each dancer, holding a safe and transformational space for all. 10% off for Student with valid ID and Senior (65+). Please contact us to register for this special rate. Let’s take the time to stop the world and pay attention to our hearts. Our attention is like a spotlight. "Freeing the body ultimately leads to freeing the heart." -Gabrielle Roth. Join us in this journey into the heart! PREREGISTRATION FOR 'FRIDAY NIGHT ONLY' OPTION IS CLOSED. REGISTRATION FOR FULL WEEKEND WORKSHOP IS STILL OPEN. Our attention is like a spotlight. Feelings live in our body parts, and when we shine the light of our attention on specific body parts, memories crack open and move, dissolving the hard hold they have on us. Shape-shifting through feelings as they come up will open us up to their messages, their symbols and their signals. One of the single-most powerful acts we can do is to share our vulnerability. The more we open up and dance through our feelings, the safer the environment becomes to explore our edges. These dances will be our offering to the bigger world. They will be our prayers for peace. My intention as a teacher, and in my own emotional evolution, is to practice staying present with feelings. So it is with great tenderness that I approach this journey into the heart, the part of us that beats and pumps and gives and receives and takes the old and transforms it into the new, purifying us, every minute of every day. The wilderness of our hearts scares us. We haven’t been taught to track our feelings, much less respect them. In fact, we often feel ashamed of them when they do pop up. Even in our own families we hold back, dismiss and deny true responses. Even in the dark of the movie theater we swallow our tears. This is very sad. We’ve lost our spontaneity. Why do we give fear so much power? To befriend our emotions, to not be frozen by fear, is our destiny on this dancing path. Fear is the clearest meter of our edge, the edge where we feel comfortable and grounded. When we start to feel uncomfortable, it’s a challenge. A challenge is an invitation to move from who we are into who we are becoming. The bigger the fear, the more important it is for us to face it. It’s not just a stoplight, it’s a huge road sign: COME DANCE WITH ME! JONATHAN HORAN is Gabrielle Roth's son and closest collaborator. He is the Executive Director of her international institute, 5Rhythms® Global as well as the Director of The Moving Center School NYC. Jonathan has been immersed in the 5Rhythms practice throughout his life and continues to be a key catalyst in its evolution. He is a member of the core teaching faculty of both training and advanced work and teaches workshops of all levels around the world. *10% off ($315) for students (with valid ID) and seniors (65+). 15% off ($297) for 5Rhythms Certified Teachers (5RTA Accredited). Please contact us to register for this special rate. Parking: Convenience fee parking at entrance to the studio. Credit card and coins are accepted. Parking fee is enforced DAILY 8am-6pm in Presidio. Free parking after 6pm. **All workshop hours count as Heartbeat on the 5Rhythms Dancing Path towards Teacher Training. THIS EVENT IS FULL. PLEASE EMAIL US TO BE LISTED ON WAITING LIST! MEDICINE CIRCLE - Weaving ritual, community, movement, sound and prayer, we connect with Spirit. Dancing together in this sacred way is our medicine. Come for a day of dance, ritual and prayer in a beautiful urban park surrounded by greenery and wildlife. This is the only Medicine Circle daylong scheduled in 2016. The number of participants are limited to create potency and sacredness of the circle. Chaos. The rhythm of absolute surrender and a deep letting go. We disappear in the dance but first our ego needs to get out of the way. The dance happens without us controlling it. We release and shake everything that we hold on to, everything that burdens us and celebrate the no mind state. We will dance each of the 5 Rhythms from the Chaos’s side, practising to soften at the point when we are ready to let go, to surrender, to blossom. Moving through all the layers of who we think we are, and what we think is important – being called by the centre of all and everything where our power grows when we surrender another layer and we become again. Chaos is the marriage of the masculine and feminine. The surrendering of the lovers. Here we practice being awake, centered in the midst of a storm and things falling apart.. We give ourselves to the wildness of a dance that can never be planned or repeated. Silvija Tomčik is a certified and accredited 5Rhythms® Teacher (Waves and Heartbeat level) and Member of the Teaching Staff of 5Rhythms® Global. She has been organizing 5Rhythms for 20 years and teaching regularly both nationally and internationally for the last 15 years. She brings her passion in a grounded way, teaching in a clear and imaginative way, blending humor with wisdom. 20% off Full Price for 5Rhythms Certified Teachers (5RTA Accredited). 10% off Full Price for Student with valid ID and Senior (65+). Please contact us to register for this special rate. A rare opportunity to dance with Alain Allard (from UK) in San Francisco! 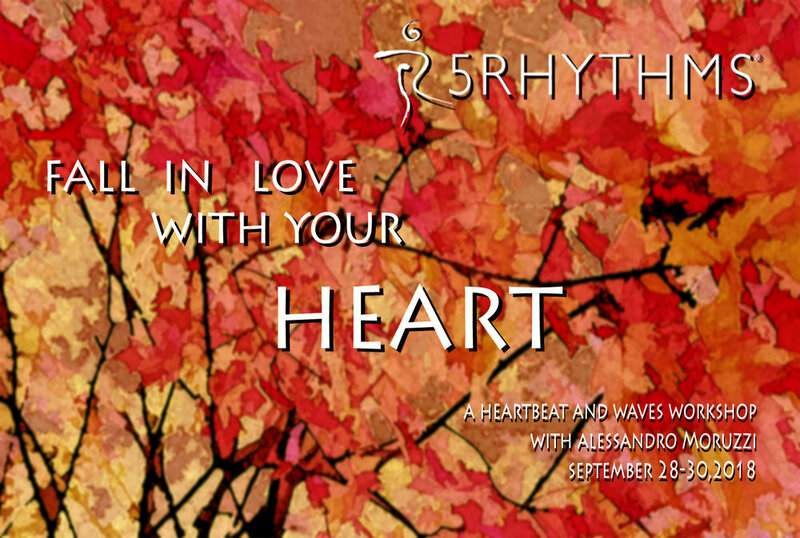 *The workshop counts as Waves and Heartbeat hours towards the 5Rhythms® Teacher Training. A Gabrielle Roth 5Rhythms® Waves workshop is the foundation of the entire body of 5Rhythms work in which we expand our class work with a deepened physical expression and knowledge of the essential 5Rhythms and their polarities. A Gabrielle Roth 5Rhythms® Heartbeat Workshop is the opening of our emotional world and focuses on how each Rhythm corresponds to the essential emotions: Flowing/Fear, Staccato/ Anger, Chaos/Sadness, Lyrical/Joy, and Stillness/Compassion. ALAIN ALLARD has been dancing the 5Rhythms® for over 23 years, and for the last 15 has been regularly teaching them in different countries, continents and contexts. He is a fully licensed and registered UKCP therapist and a gifted humorous teacher accredited by Gabrielle Roth to teach the Waves, Heartbeat and Mirrors level maps of her work. He is a Faculty Trainer for the 5Rhythms Teacher Training program. His workshops in the Perspectives series can be substituted towards additional Mirrors requirements for the Teacher Training (full details of this available in 5R Global). 10% off full price for students and seniors (over 65); 20% off full price for 5Rhythms Certified Teachers (5RTA accredited). Please select Types of Tuition when you register below. In this wild reality of life that can be overwhelming and distracting, where do we start to explore and find the thread to freedom. Through the practice of the 5Rhythms, we find ways to focus on each of the rhythms and continue the journey with greater awareness. Each body part is a gateway to the unexplored wilderness. By exploring our bodies on the physical realms, we identify our patterns in motion that will bring us to lift the veil of our consciousness and connection to our truth. So we begin the Gateways series feet first! This exploration through the gateways is open to all, whether you’re new to the practice or seasoned dancer. Join us! Vehllia Tranne is Founder of The City Waves™, Certified 5Rhythms® Teacher Accredited by the 5RTA (5Rhythms Teachers Association), and a 200 hour Yoga Teacher Certified by Yoga Tree San Francisco. All class/workshop hours with a 5RTA member teacher count towards the training path prerequisites for 5Rhythms certification. Vehllia has been celestially dancing before even learning to walk. She is a natural teacher and her dancing is her way of healing and inspiring in life as well as in the 5Rhythms practice. Her connection with her volcanic ancient ancestral land is evident in her grounded flowing and it's a sacred gift for all of us. Her spontaneity and sincere love for life is expressed beautifully in her inspirational dance offering to anyone interested in a deep transformational exploration of themselves through moving meditation. The 5Rhythms is a moving meditation practice, an improvisational form of dance. This is a map of how energy moves. It shows us the patterns, rhythms and cycles of life. Flowing connects us to our feminine nature. Staccato connects us to our masculine nature. Chaos dissolves and integrates these two energies. As a result we find transformation in Lyrical. From this transformative space we are then connected to Stillness. The nature of the stillness dance invites compassion and connection to self, partners and community. Each of these rhythms is present within us at all times. We have discovered that every person has a dominant rhythm. This is the primary energy that moves and inspires the unique expression of who are. We investigate these qualities in order to understand ourselves more. In learning about our “home” rhythm, we can look at both the light and shadow aspects to see what moves us and what stops us from moving. How comfortable are you in your body? Some say, “Home is where the heart is”. If so, then the body we are given is our one true home. Through this method we can learn to love the home we have been given, and appreciate the gift of this body and this life. Find your home rhythm. Learn to know yourself better. Become fascinated with yourself. In doing so you will better serve the world and all those you love. Lucia Horan was born into the family of the 5Rhythms®. She has been dancing with Gabrielle Roth from the time of her birth. Lucia was born and raised in the community of Esalen® Institute, in Big Sur, CA. She was certified to teach the 5Rhythms in 1998. She is recognized as an international teacher of the 5Rhythms® practice and a faculty member of 5Rhythms Global®. Lucia currently resides in Maui, Hawaii. Lucia is Certified 5Rhythms® Teacher Accredited by the 5RTA (5Rhythms Teachers Association). All class/workshop hours with a 5RTA member teacher count towards the training path prerequisites for 5Rhythms certification. From Presidio Blvd, turn left on Funston Ave, right on Moraga Ave. The studio is located at the corner of Moraga Ave and Arguello Blvd, across the street from Presidio Crissy Field main post. Convenience fee parking at entrance to the studio. A Gabrielle Roth 5Rhythms® Heartbeat Workshop is the opening of our emotional world and focuses on how each Rhythm corresponds to the essential emotions: Flowing/Fear, Staccato/ Anger, Chaos/Sadness, Lyrical/Joy, and Stillness/Compassion. Fascinated by the artistry and healing nature of theater, dance, and self-expression, Davida moved to NYC to work closely with Gabrielle Roth in 1989 and began teaching the 5Rhythms in 1994. She is widely known for her delightful sense of humor, passion, and evocative devotional teaching style. Davida is full-heartedly committed to this embodied path and knows that it not only ignites our creativity and informs our daily life, but also greatly enhances our sense of well being and aliveness. Davida is Certified 5Rhythms® Teacher Accredited by the 5RTA (5Rhythms Teachers Association). All class/workshop hours with a 5RTA member teacher count towards the training path prerequisites for 5Rhythms certification. to move out of or away from something and come into view. "black ravens emerged from the fog"
The 5Rhythms moving meditation gives us the tools to explore, listen and give space to our bodies in order to experience freedom. Through the discipline of being in our bodies, this movement practice inspires us: to rise from the darkness to the light; to evolve to our fullest potential in this lifetime; to emerge, breathing in fresh air, from stagnant feelings produced by our habitual series of routine movements and postures; to create desire away from boredom to be able to embrace life to its fullest & follow the path to truth. Whales breaching is a very elegant, enthusiastic and spectacular way of emerging joyfully out of the water. As human beings, let's be inspired by the dance of these amazing creatures to seek ways to express ourselves with grace and elegance, taking powerful steps toward our own growth & realization as individuals and in community. We will emerge through the 5Rhythms Maps: in Flowing we find our feet in harmony with the Earth element, in Staccato we build our strength and determination fueled by Fire, in Chaos we let go of the weight that keeps us down witnessed by Water, in Lyrical we experience the lightness of our being enveloped by Air, and in Stillness we rest on the feeling of completion suspended in Ether. Alessandro and Vehllia are Certified 5Rhythms® Teachers Accredited by the 5RTA (5Rhythms Teachers Association). All class/workshop hours with a 5RTA member teacher count towards the training path prerequisites for 5Rhythms certification. Together, Alessandro and Vehllia offer more than 12 years experience in 5Rhythms dancing, music, theater and performance background, healing and spiritual practices, and shamanism, offering heartfelt and intuitively crafted experience and support for each dancer, holding a safe and transformational space for all. Join us for a weekend of soulful exploration and dynamic movement with the elements! Work study and 5Rhythms Scholarship Fund are available. Please contact us to check if you qualify. There's a spacious parking lot at entrance to the studio. Plenty of FREE parking after 6pm. Parking meter enforced 8am-6pm (credit card accepted).